Known as "Kealoha", Honolulu-born Steven Kealohapau'ole Hong-Ming Wong is Poet Laureate of Hawaii. Presented earlier this year by proclamation, Kealoha is the first official Poet Laureate of Hawaii and serves a largely ceremonial function, charged with promoting the writing, reading, performance, and appreciation of poetry throughout the state and with representing Hawaii at official events. He performed his poem "New Day" at the inauguration of Hawaii governor Neil Abercrombie, who named him to the position. In making his announcement, Abercrombie described Kealoha as "an inspiration to the people of Hawaii" and "a leading force in promoting literacy and creative expression." 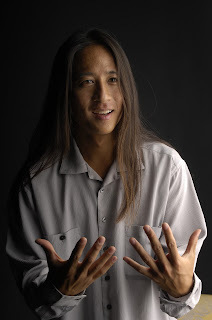 An internationally known "slam poet", Kealoha has performed around the world at concerts and festivals, conferences and workshops, educational institutions at all levels, and community functions. He also has performed in film and on television and radio. His 70-minute CD Kealoha was issued in 2004. The founder of HawaiiSlam, Youth Speaks Hawaii, and First Thursdays, a well-attended slam poetry competition, Kealoha became a professional poet in 2002. In 2007, he was ranked eighth (of 350 poets) at the National Poetry Slam (the world's largest team performance poetry event) — he has represented Hawaii more than a half-dozen times and performed in the finals at least four times — and was deemed 2007 Slam Champion at Burning Man Arts Festival. Among other honors, he was named "National Slam Legend" in 2010 and selected the same year as a National Endowment for the Arts "Master Artist".